The perfect blend of Power and Affordability. Salton developed the Power Blender in partnership with Harley Pasternak, New York Times bestselling author, celebrity trainer and nutritionist to the Hollywood Stars. Powered by a 1500W, 2HP motor that produces 30,000 rpms, and includes an 8 blade blending system that will blend, crush, emulsify, chop, puree, liquefy whole fruits and vegetables, ice, frozen fruits and nuts. Start your morning off with a smoothie, prepare hummus for a snack and a hot soup for dinner. 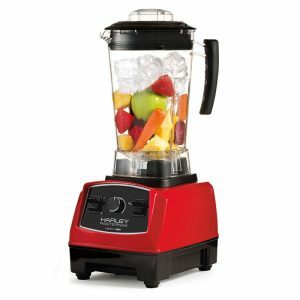 No matter what you throw into to the 2L Vortex Jar, the Salton Harley Pasternak Power Blender will handle it easily and following Harley’s recipes in the bonus color book will certainly help you boost your healthy lifestyle. 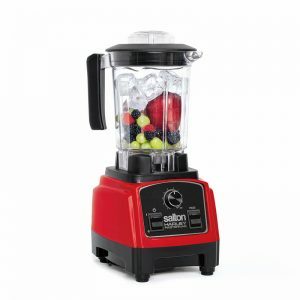 The Salton Harley Pasternak Compact Power Blender has a Vortex Jar with 8 stainless steel, Japanese blades and a 2HP, 23,000RPM, 1000 watt motor. With its powerful motor and innovative design it can blend, emulsify, chop, puree, crush and even make a hot soup! It also comes with a recipe book loaded with delicious, healthy recipes and two on-the-go bottles so you’ll never leave your smoothie behind. This hand blender is perfect for dips, sauces, soups, baby food, milkshakes and more! With a one-touch operation, just immerse the unit into your bowl/container and away you go! No need for extra cleanup. 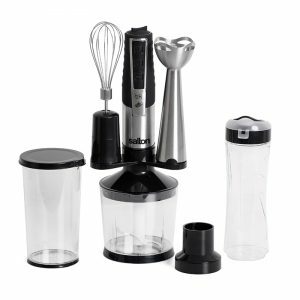 Set comes with the blender and whisk attachment, a 16oz / 500ml measuring cup, and a 16oz / 500ml chopper.